Today is the second day of the year and the first working day for most people. If you are like me you began your day putting up new calendars. I started my day by taking down and throwing away all of my old calendars and replacing them with the new ones I have recently purchased and printed. I personally enjoy the wall calendars because they are have two things about them that digital calendars do not: they are often a work of art, and they can be used as a physical copy for that moment when technology fails you. The primary reason for having a calendar is to organize the days, weeks, months and years. It keeps a track of which day of the week events fall and when special events are going to happen. Historically speaking calendars were often uses to preserve religious holidays and events. They would mark down on a tablet when a particular event or celebration should take place so that they remember when it happens; this is why many calendars you purchase from a store will have important dates listed such as Christmas, New Years, and Thanksgiving. While some will still use calendars for marking religious holidays, many more will use it to record special events that are about to come. Such as your spouse or son and daughters birthday, doctor appointments, and vacation days. Business people will use it to record when they have their next client lunch or when they need to stop by a customer’s store. This is the application most important in the business sense is that it allows us the ability to jot down when we have something upcoming like a mixer or a lunch meeting in advance and store it for our convenience. Just remembering it in your head might not always work. Sure you might remember the important days like your husband or wife’s birthday (although some do forget), but remembering that you have an appointment with Phil from XYZ Company on February the second might slip your mind 1 month from today. For marketing purposes calendars also serve a very important role. This can be used simultaneously as a promotional tool and a customer gift. When you give them to a client they are first and foremost receiving a gift from you. If used they will be constantly reminded of your brand, your company and your product line. And that can be a powerful thing because it is being used as a constant reminder of your brand to them throughout an ENTIRE year. Just think about how many times during the year your imagery and brand will be entering the subconscious of your clientele. Calendars can become a work of art with the right designer and graphics. We recently transformed one company’s brand image by creating them a calendar with brilliant graphics and the capacity to have it used not only as a marketing tool but also a revenue generating device. Calendars are good for the individual using them and they are good for the business who uses them to market their business. They have many functions and applications. 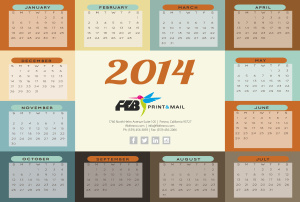 Printed calendars can be done with spiral bind, wire-o binding, saddle stitch or as a poster. Whether the angle is for traditional purposes of remembering dates or for marketing your company and your business, it is as vital today as it ever was for your everyday life and for business. Now is the time to get talking with your local designer and printer about having your 2014 brand image created for you. For your viewing privilege I have linked my company’s calendar here ready for you to download and save to your desktop free of charge FTB Print & Mail Calendar. 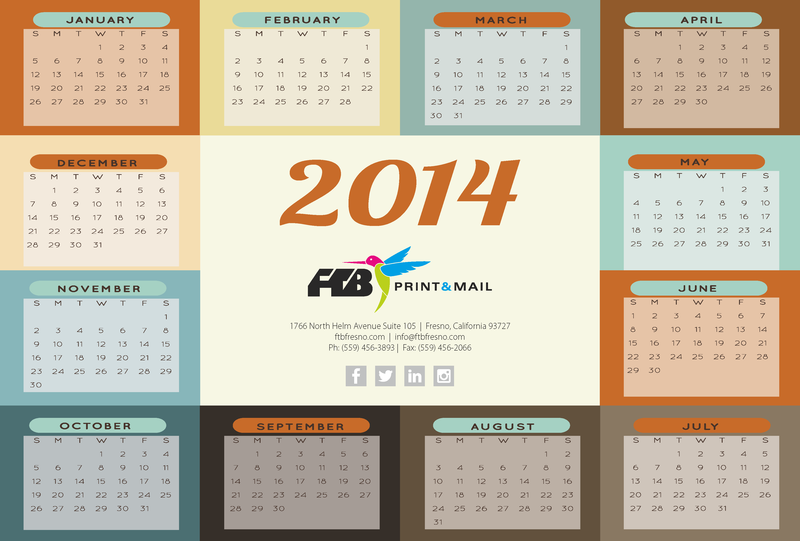 Contact us today at 559-456-3893 or by email at info@ftbresno.com to start creating your 2014 calendar.